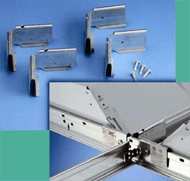 AGI AC184 compliant seismic fixture clamps for suspended ceiling light fixtures. 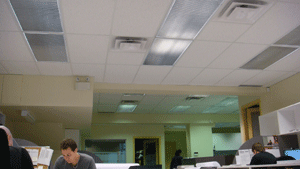 An effective way to attach lighting fixtures to suspended ceilings in Seismic Regions. AGI was one of many partners in the shake table tests at the University of San Diego (UCSD). Videos: Behavior of Interior-Level 2 & Earthquake-Resilient Hospitals for the Future by USTV. Learn how the patented Seismic Fixture Clamp (SFC) is the first effective and approved positive connection device proven to meet the Building Code requirements . The lighting fixture is suspended to the ceiling grid by Seismic Fixture Clamps (SFC) at all four corners to ensure that it is earthquake safe.